Few things are as irritating as ringing in the ears. This annoying and disruptive occurrence is also known by its medical moniker: tinnitus. Ringing in the ears is not a medical condition but rather a symptom, according to the Mayo Clinic. It can be caused by a range of conditions, such as an ear infection, damaged hairs inside the ears and ear wax blockage. Stress, high blood pressure and old age are also common causes of tinnitus. If ringing in the ears is particularly persistent or painful, you should see a doctor. However, most ringing in the ears can be treated using home remedies. Continue reading to learn to treat tinnitus at home. 1. Skull thumping. Follow these directions, as provided by Home Remedy Hacks: Cover your ears with your palms. The fingers should point backward, middle fingers touching at the back of your head. Rest your index fingers atop the middle fingers. Then, flip your index fingers off the middle fingers and onto the back of your skull, making a thumping or beating noise. Repeat this motion 40 to 50 times until the ringing subsides. 2. Apple cider vinegar. Home Remedy Hacks swears by the natural remedy of a glass of water with 1 tablespoon apple cider vinegar and 1 tablespoon honey. Drink two to three times daily to relieve ringing in the ears. 3. Garlic. Heat a clove of crushed garlic in a pan with 1/2 tablespoon mustard oil. Once the garlic turns light brown, remove the pan from the heat, let the oil cool and strain out the garlic. Using a dropper, release two drops of oil into the affected ear up to two times daily, suggests Trends & Health. 4. Onion. Crush an onion and use a dropper to extract the juice. Lying down, release two drops of onion juice into the affected ear. Use this remedy once a day until the ringing subsides, suggests Trends & Health. 5. Pineapple. Eating plenty of this tasty fruit increases blood circulation, making it effective in reducing ringing in the ears in certain situations, says Trends & Health. 6. Ginger. Chewing on raw ginger can help ease tinnitus, says Home Remedy Hacks. 7. Foot bath. Perhaps most surprisingly, a hot foot bath followed by a cold-water foot bath can reduce ringing in the ears, reports Home Remedy Hacks. 8. White noise. Dr. Axe recommends using a white noise machine or app to ease tinnitus, improve concentration, induce sleep and increase relaxation. 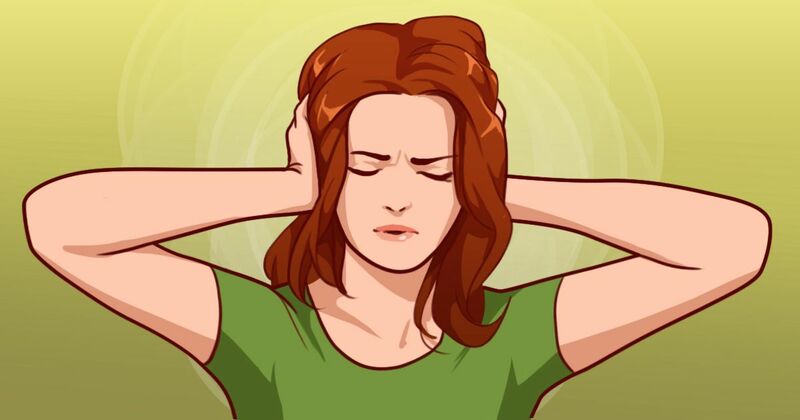 How do YOU treat tinnitus at home? Tell us when you SHARE this article on social media!